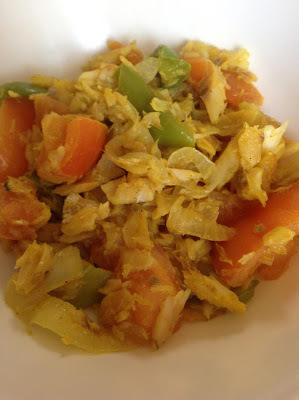 We celebrate Creole Day during the month of October in Dominica and one of the staple items on any Creole Day menu is salt fish. Salt fish is really Cod, dried and salt cured. It is also done with Pollock if you can't find cod. A lot of time it is packaged with the bones in so be sure to remove the bones before preparation. You MUST re-hydrate salt fish prior to preparation. My grand-mother used to soak the fillets in cold water overnight. The next day she would discard the water, then boil in another pan of water. This is done to remove the excess salt. You don't want to boil it too much to remove all the salt though. I usually rinse off in running cold water then boil it twice, discarding the water after each boil, because I never know if I'm going to cook salt fish the night before! Once the excess salt is gone and it has just enough to be tasty, you shred the fillets and remove any bones. Set aside. Add salt fish and using a spatula (or my trusty wooden spoon) combine all ingredients together. One Creole day (or whenever) we ate salt fish, roast breadfruit and cucumber salad for breakfast and salt fish over boiled green bananas for lunch. On a regular day, bake (a fried bread) and salt fish is always welcome for breakfast, lunch or dinner too! If you have none of the above, you may serve of rice. Enjoy!